The incident has sparked the hashtag #ClothingHasNoGender. A Missouri high school student is sparking change after feeling "very upset and embarrassed" when he said a school administrator told him the outfit he wore to school for his birthday last Friday was "distracting" and was "for women." The student, Morgan Ball, 17, said he was wearing a white t-shirt with a black shawl over it, jeans, a fashion belt and lace gloves. He also had on jewelry and make-up. The hashtag #ClothingHasNoGender was then started by his friends at Lee's Summit North High School to support rights of self-expression. The hashtag has also been printed on shirts and decals, which fellow students are buying to show their solidarity with Morgan. "The support has been tremendous," Morgan's dad Jason Ball told ABC News today. "What could have been the worst birthday in his life turned into the best birthday of his life. Morgan's mom, Cheri Ball, took to Facebook last weekend to express her concern after what happened on her son's 17th birthday. Cheri said her son was a proud, gay, young man who "expresses himself with a fun flair for fashion," and then explained a school administrator called Morgan to his office to "address [Morgan's] appearance." "Apparently, some students and staff members complained his outfit was 'distracting,'" Cheri wrote, "and instead of taking the opportunity to educate those individuals about Morgan's right to self-expression, she asked him to remove his beaded shrug, lace gloves and fashion belt." One of the assistant principals asked Morgan, "Do you have a gender identity issue?" and "Are you aware that you're wearing women's clothing?" Morgan told ABC News today. "It came off homophobic, and I was very offended," Morgan said. "Those questions didn't need to be asked, especially because people know I'm very confident and comfortable with myself." Nonetheless, he took the accessories off but decided to put them back on a little later because he wasn't violating the dress code, Morgan said. However, he said he was called a second time back to the office and because he was scared, he removed the items again. Morgan's friends saw how upset he was at the end of the day but were determined to make his what was turning into a "crappy" birthday better, he said. The family discovered Morgan's friends were using the hashtag #ClothingHasNoGender on social media later that night, and they even printed t-shirts made to express their outrage and offer support. One of Morgan's friends, Lizzy Wrisinger, wrote a blog post on the incident and was interviewed in a student-made video promoting the hashtag #ClothingHasNoGender. "A lot of the students have been backing him up and supporting him through it," she said in the video. "You should never judge a book from its cover." The Lee's Summit R-7 School District told ABC News today in a statement that they could not "comment on specific student issues" but did say there were "no students sent home or assigned discipline for dress code violations at Lee's Summit North High School on Friday, March 13," and that "no parents have contacted the school principal with concerns regarding a dress code issue from Friday." 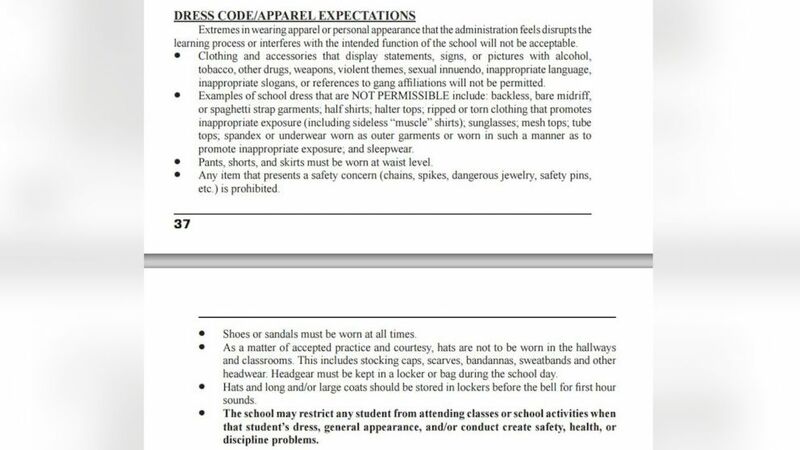 (Lee's Summit R-7 School District) A screenshot of Lee's Summit North High School dress code policy is pictured here. Morgan's family met with school administrators Wednesday afternoon, his dad Jason said, adding that it was very positive, and they concentrated on finding ways to make sure Morgan and other LGBTQ students could feel comfortable and safe at school. "They said he didn't violate any of the dress code policy except for one rule mentioning students couldn't wear anything 'distracting,' which is a really subjective term," Morgan's dad said. "We're going to work with the school to change the dress code policy's language, so all students can feel comfortable wearing what they want as long as it's not offensive or disrespectful." Next Monday, Morgan said students at the school will be wearing the t-shirt with the logo #ClothingHasNoGender, and on Tuesday, he and his friends are encouraging students to participate in 'Gender Swap Day.' They're asking guys to wear feminine clothing and girls to wear masculine clothing to shatter societal expectations of what males and females should look like, he said.